There is some place up there in the stratosphere where rock legends like Roger McGuinn don't have to be Byrds to reach... although the distinction of being a Byrd and a member of one of the greatest rock bands of all time does make the trip a bit easier to accomplish. The Byrds practically changed single-handedly the face of the L.A. music scene in the 60's and early 70's, and indeed, Roger McGuinn's Rickenbacker twelve string guitar did much to define folk rock and, through Roger, became an integral element of its style. Now the Byrds have been accorded the ultimate tribute by their induction into the Rock and Roll Hall of Fame on January 16, 1991 at the Waldorf Astoria Hotel in New York. It is a fitting memorial to a band composed of some of the most talented, creative and brilliant musicians to ever come together to make music. 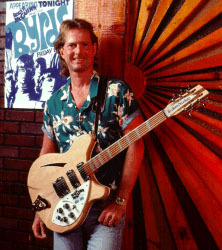 Rickenbacker has also kept a record in the way of tribute of some notable musicians who acquired the Rickenbacker Roger McGuinn Limited Edition guitar before it sold out: George Harrison... The Traveling Wilburys - Pete Townshend... The Who - Tom Petty... Heartbreakers & Traveling Wilburys - David Crosby... Crosby, Stills, Nash - Peter Buck... REM - Dave Stewart... Eurythmics - Marty Willson Piper... The Church - Ed King... Lynyrd Skynyrd - Al Perkins... Dolly Parton Band and Manassas - Earl Slick... formerly Paul McCartney Band - Gerry Beckley... America - Jeffrey Foskett... Endless Summer, formerly The Beach Boys. Above are just a few of those who will be able to share in a small part of the heritage of Rock and Roll and remember the "Tambourine Man" and his place as one of the legends of Rock history. Also to be remembered are the guitar and its sound that for sixty years is a creator of Rock and Roll stars and remains a tradition of American popular music.